William Thompson was born on June 26, 1824 in Belfast, Ireland, of Scottish-Irish descent. His father, James Thompson was at the time a mathematics professor at the Royal Belfast Academical Institution. His mother, Margaret Gardner, died in 1830 and in 1832 his father took his six children with him to Glasgow, Scotland, where he had been elected chair of mathematics at the University of Glasgow, his alma mater. William, and his older brother James received their early education at home, from their father. He entered the University of Glasgow in 1834 at the age of ten. At 12 he won a prize for translating Lucian of Samosata's Dialogs of the Gods from Latin into English. His first scientific paper was published in 1841 and in that year he entered St. Peter's College, Cambridge to read for the mathematical tripos. During his time at Cambridge he rowed for his college and remained involved in nautical pursuits throughout his life. He graduated in 1845, second wrangler (the university examiner commented that the Senior Wrangler "was not fit to cut pencils for Thompson") and winning first place in the Smith's Prize competition. He was elected fellow, shortly thereafter. At the time experimental physics was not taking place at Cambridge, so after graduation he took his fellowship to Paris, and he worked in the laboratory of Henri Regnault for a year, where he determined data on a number of physical constants. In 1846 the chair of natural philosophy at Glasgow University became vacant and Thompson was elected. He remained in the position for fifty-three years until his retirement in 1899, despite many invitations to leave and go elsewhere. He was an inexhaustible worker, producing almost six hundred papers, seventy patents, as well as a number of books during his tenure. Thompson is most famous for his work on an absolute zero temperature, a temperature at which entropy is reduced to its lowest possible value. The Kelvin temperature scale, named after Thompson, has its zero at -273.15 degrees Celsius or -459.67 degrees Fahrenheit. At this temperature nearly all molecular motion stops and pure substance form perfect crystals. It is not possible to reach absolute zero artificially, but there are techniques to get within a billionth of a degree using cooling lasers. Thompson served as the electrical engineer during the laying of the first successful Transatlantic Telegraph Cable and was knighted for his services. He was elected to the Royal Society in 1851 and won the Copley Medal in 1883. 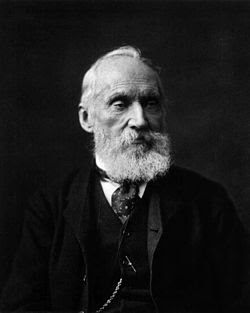 His title, Barron Kelvin, bestowed on him in 1892, origninated from the River Kelvin which runs through the grounds of the University of Glasgow and he is the first scientist who served in the House of Lords. He died on December 17, 1907. Thanks for this and appreciate your blog. I find thermodynamics, and the hairy dudes who built the science, a source of great wonder and inspiration.